These values derived by J.C. Slater are an empirical set of atomic radii derived by the careful comparison of bond lengths in over 1200 bond types in ionic, metallic, and covalent crystals and molecules (reference 1). The idea is that for a bond A-B, the atomic radius of A added to the atomic radius of B will give a reasonable estimate for the A-B separation in whatever environment. A single set of radii is very useful for most purposes, however, for very accurate work adjustments would have to be made to the values quoted to reflect the specific environment of the element (such as coordination number). Values are given to an accuracy of about 5 pm. 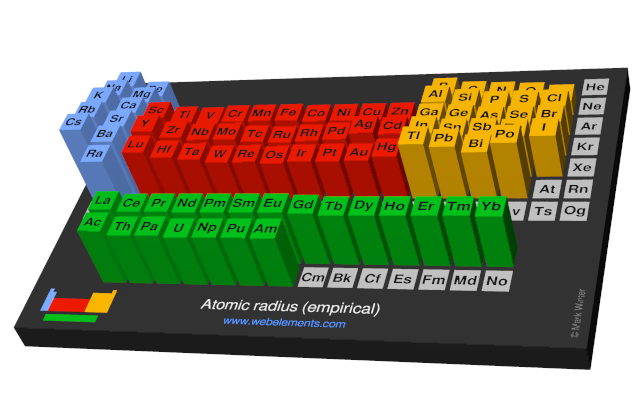 Image showing periodicity of the chemical elements for atomic radius (empirical) in a periodic table cityscape style. 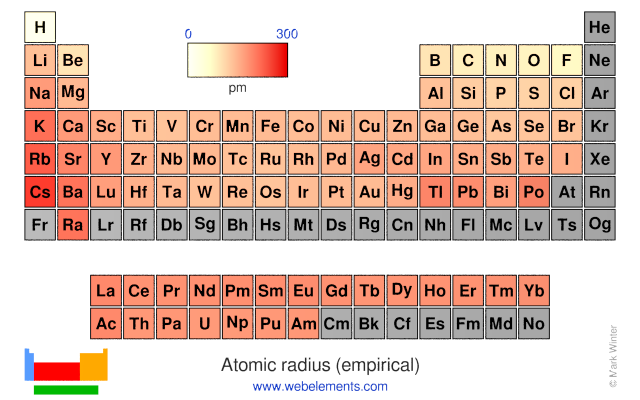 Image showing periodicity of the chemical elements for atomic radius (empirical) in a periodic table heatscape style. 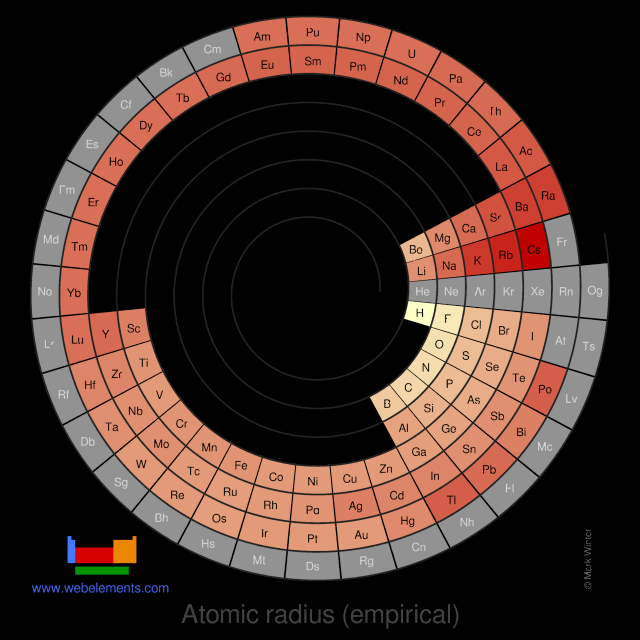 Image showing periodicity of the chemical elements for atomic radius (empirical) in a spiral periodic table heatscape style. 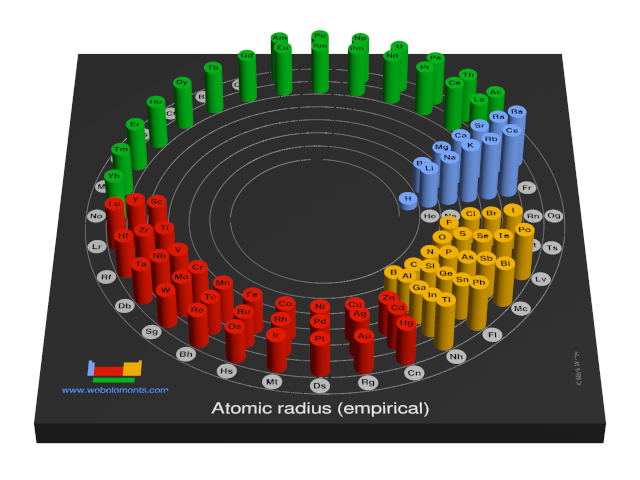 Image showing periodicity of the chemical elements for atomic radius (empirical) in a 3D spiral periodic table column style. Image showing periodicity of the chemical elements for atomic radius (empirical) in a 3D periodic table column style. J.C. Slater, J. Chem. Phys. 1964, 39, 3199.